This is the first evidence that endoscopy of the gastrointestinal tract is safe and efficacious in the giant panda. However, it was clear that effectiveness is tightly linked to a sufficient fasting time as well as adequate anaesthesia and availability of suitable equipment. Under appropriate conditions, we were able to examine thoroughly and document the status of the oesophagus, stomach, proximal duodenum and colon. We also suspect that the relatively easy entrance into the small bowel was facilitated by the pharmacological manipulations described. 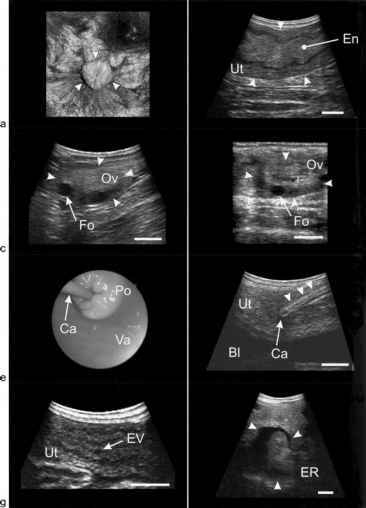 There was a remarkable lack of gastrointestinal problems in this panda cohort, the exception being a stomach ulcer in a seven-year-old male (who interestingly had a history of vomiting). More minor abnormalities were detected in other individuals, and in all cases it was possible to secure biopsied tissue safely. Although the purpose of this chapter was not to correlate biopsy and endoscopic assessments, it is important to note that all endoscopic observations were supported by histopatho-logical findings. Clearly gastrointestinal endoscopy is another effective and safe tool available for monitoring the health of the ex situ giant panda population. There appear to be three high priorities. Although initial observations here seemed to indicate no consistently serious anomalies to the gastrointestinal system, it is now necessary to apply this technology to other individuals, including those that display nutritionally related problems, for example, mucous stools (see Chapter 6). In the case of the present chapter, there is also a need to further correlate the histories of specific individuals with endoscopic observations. Each of the adult animals in this cohort had experienced challenges to normal health and/or reproduction. This is a particularly important concern for individuals who may be clinically compromised (e.g. SB 454) and could benefit from potential therapies, with success monitored by additional endoscopy. A final high priority is the training of Chinese veterinarians who have the ultimate responsibility of managing most of the giant pandas living ex situ. Although this technology is becoming quite common in the west (especially for companion animals), there is little fundamental expertise for wildlife, including for highly specialised species such as the giant panda. While its safety and utility have been demonstrated here, endoscopy requires a batch of combined skills in general anaesthesia with volatile gas, the availability and effectual use of sophisticated fibre-optic equipment and especially the ability to diagnose what is normal versus abnormal. For the giant panda to benefit fully will require additional partnerships and the sharing of information and skill between appropriate Chinese and western institutions.